$69.00 NOTE: Our shopping cart is disabled. We are using it to display affiliate items which if you click on PURCHASE in the PRODUCT INFORMATION by scrolling below or click on the Amazon banner the RRDi receives a small affiliate fee upon completion of your purchase. Mahalo. THE ULTIMATE SCIENCE-BASED CALMING CREAM - This nourishing, vegan-friendly cream contains our proprietary c3 Organic Calming Plant blend. C3 reduces the appearance of minor redness and promotes the skin's healthy response to minor environmental stressors. THE CLEAN BEAUTY DIFFERENCE - Ethically sourced and certified cruelty free. No Petroleum, Gluten, Parabens, formaldehyde, SLS/SLES, or PEG. 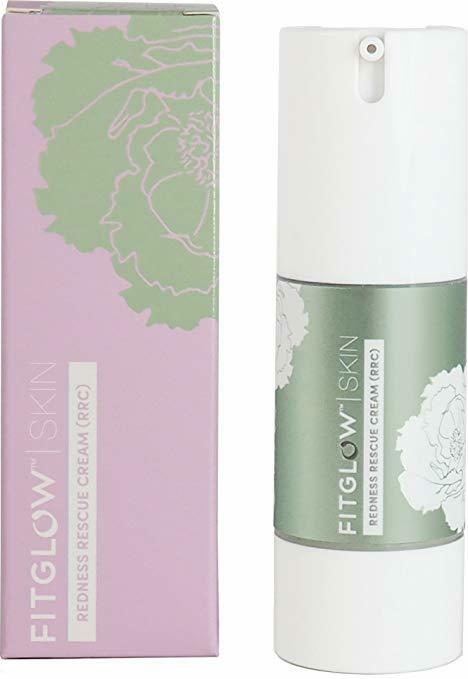 All fitglow products use organic ingredients and no fillers or toxins, ever. Calm stressed skin with Redness Rescue Cream. Our proprietary c3 Organic Calming Plant blend supports the look of visibly irritated skin. Green mineral tint immediately reduces minor visible redness while local organic grape seed oil hydrates without greasiness. Natural Skin Doctor Approved.